On 1st June, 2017, Mildmay Institute of Health Sciences inaugurated the first guild leadership. 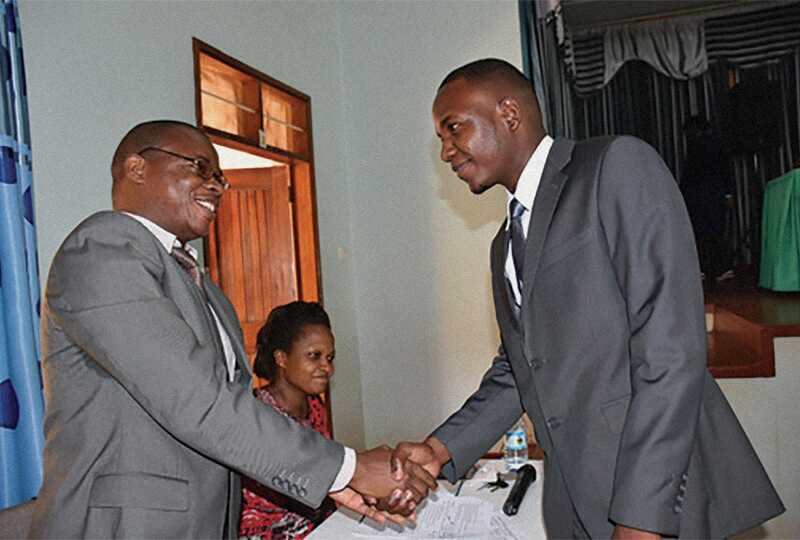 The eight guild team was sworn in, in a ceremony presided over by Senior Assistant Secretary- Desk Officer of student’s affairs, Ministry of Education and Sports,Mr.WamaniGodfreyatthe main campus in Lweza. Mr Wamani underscored the need for dialogue between students and the administration so as to remain in harmony. “I thank Mildmay Uganda for not being autocratic and have allowed students to participate in the school administration and regarding them as key stakeholders. Dialogue helps in the provision of information flow and creates understanding within the school", he said. Mr Wamani cautioned the guild council to lead according to the will of students and administration rather than prioritizing themselves and friends if they are to succeed. Joshua pledged to act as a focal person between the students and the institute. "I pledge to oversee communication between the guild council, the school administration as well as maintain an over view of all guild activities and act as the principal contact point for student matters and campaign for change”.